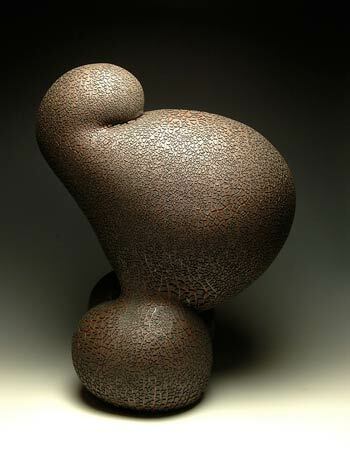 "Endurance B", 2009, Earthenware and glaze, 13"x21"x9"
Born and raised in Kobe, Japan, Mika Negishi Laidlaw has worked both in the U. S. and Japan. She earned B.A. in Studio Art from Southern Illinois University at Edwardsville in 1994. After the undergraduate study, Mika went back to Japan to work as a ceramic apprentice at Akishino Pottery, and studied traditional pottery under Masaya Imanishi from 1994-7 in Nara-City, Japan. In 2000, She received her M.F.A. 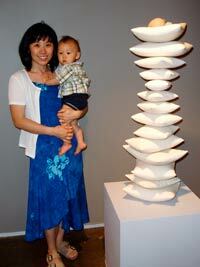 in Ceramics from Kansas State University where she met her lifetime mentor Yoshiro Ikeda. Other accomplishments include; recipient of 2001 McKnight Artist Residencies for Ceramic Artist at Northern Clay Center, Summer Artist Residence at the Archie Bray Foundation for the Ceramic Art in 2002, 2004 Emerging Artist at the annual conference of National Council on Education for the Ceramic Arts (NCECA) in Indianapolis, demonstrator of 2006 NCECA in Portland, OR, and recipient of 2006 and 2011McKnight Fellowship for Ceramic Artists. She exhibited nationally and internationally including, Japan, Korea, Taiwan, Guam, and Spain. She currently teaches as an Associate Professor of Art at Minnesota State University, Mankato. Mika lives in Minnesota with her husband Les and two small children. © Copyright Mika Negishi Laidlaw All Rights Reserved.